This blog was written by Esme Kadzamira, Centre for Educational Research and Training, University of Malawi. I was privileged to attend the London launch of the 2018 Global Education Monitoring (GEM) Report Gender Review on 8th March 2018. The panel discussion, involving a number of key players from UNESCO GEM Report team, Malala Fund, Relief International and the Right to Education Initiative was quite illuminative. 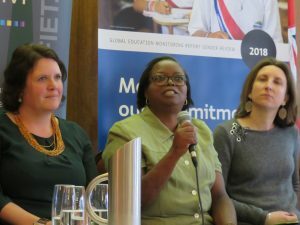 Coming from Malawi, where gender parity is yet to be achieved at upper primary, secondary and tertiary level, the discussion that ensued highlighted ways in which governments and other stakeholders can be held accountable in order to achieve gender parity and equality in education. In this context, I shared with the panel how in Malawi, a number of traditional chiefs – who typically oversee a number of villages each headed by a village chief – have taken responsibility to enforce school attendance and end child marriages in their areas. Traditional chiefs are custodians of culture in most of rural Malawi and therefore are an important agent of change in ensuring long-lasting change in communities with regard to supporting girls’ education and also ending gender-based violence against girls and women in society. Some traditional chiefs have been able to implement change by enacting by-laws to end child marriages, which have been identified as major impediments in achieving gender equality in school participation. Two traditional chiefs (one female and one male) in Dedza and Ntchisi districts have enacted by-laws to end child marriages in the villages under their jurisdiction. The chief in Ntchisi uses the institution of Gule Wamkulu (Mask dancers) to monitor school attendance and child marriages. Once it is verified that a child marriage has taken place, he uses his counsellors and Gule Wamkulu to annul the marriages. The parents of the child bride or groom are fined two chickens, one of which is given to the Gule Wamkulu and the other one is given to the chief. The chief of the village where the child marriage has taken place is fined a goat, which is sold for K30,000 (£30) and the proceeds are used to assist vulnerable girls and boys attend school. The proceeds from the fines go to a fund used to assist vulnerable children to attend school by buying school supplies and paying school fees for needy secondary school students.